* All times are local time for 36°57'N, 86°25'W. Time is adjusted for DST when applicable. They take into account refraction. Dates are based on the Gregorian calendar. * All times are local 36°57'N, 86°25'W time. * All times are local time for 36°57'N, 86°25'W. Time is adjusted for DST when applicable. They take into account refraction. Dates are based on the Gregorian calendar. Illumination is calculated at lunar noon. 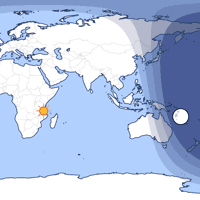 * All times are local time for 36°57'N, 86°25'W.